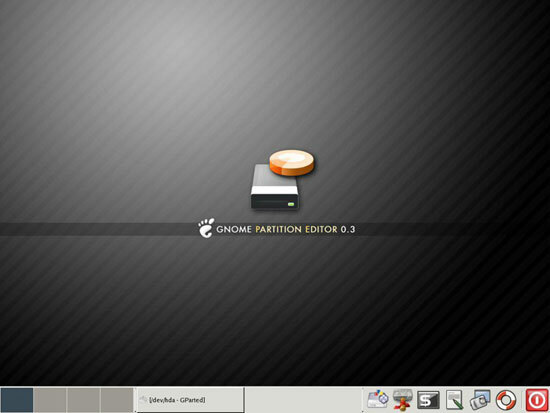 This article shows how you can modify the partitioning of your Linux system with GParted (Gnome Partition Editor) without losing data. This includes resizing partitions (enlarging and shrinking), moving partitions on the hard drive, creating and deleting partitions, and even modifying filesystem types. GParted is a free partition editor available as a desktop program and also as a Live-CD. It supports the following filesystems: ext2, ext3, fat16, fat32, hfs, hfs+, jfs, linux-swap, reiserfs, reiser4, ufs, xfs, and even ntfs (Windows). As partitions must be unmounted in order to be modified, I think it's a good idea to use the GParted Live-CD instead of using the desktop application. Therefore I have downloaded the latest GParted Live-CD (0.3.3 at the time of this writing) from here: http://sourceforge.net/project/showfiles.php?group_id=115843&package_id=173828 and burnt it onto a CD. It is very important that you back up all your data before you modify your partitions with GParted. If all goes well, no data should be lost, but you can never know! In the following I will perform some operations just to show you how GParted works and what it can do. I don't say that all these operations make sense on a production system, but for demonstration purposes they are ok.
hi, I was following above process to shrink my ntfs drive using gparted, but I see that 'Rsize/Move' option is not active so cant proceed further.please help. Hello, did you try first to unmount it, and then rsize/move? Thank for this! Very helpful... Had to resize my root partition. No data lost! Absolutely fantastic, even a mug like me followed this properly. Thank you for a step by step guide. These are the types of things needed by old(er) people like me. Have done this successfully with several installed harddrives. Just gotta LOVE GPartEd! Even had to do a slight "reshuffling" on one of them. GPartEd has been one of my favorite utilities for years. - Good stuff here. - Keep up the good info. the file system ntsf from RAW..? ?